I’m having a fairly productive weekend! In between cleaning out closets, I was able to finish and list this new work titled, ‘Be Set Free’. That’s what cleaning out clutter feels like to me~it sets me free! Sometimes I am just in the mood to purge and I go at it like gangbusters getting things cleaned out and organized. Now in the midst of this cleaning frenzy, my house looks like a hurricane came through (thoughts and prayers to those going through ‘real’ hurricanes:-). But, there is a method to my madness, and an upcoming neighborhood garage sale to spur me on. Don’t forget about the Mind Wide Open voting that begins tomorrow. I have seen a couple of the other entries, and they are gorgeous! You can scroll down to see mine, I’ll keep my fingers crossedxxx. Hope you are all enjoying your weekend, productive or not! Thank you for your kind words on my MMM piece. I’m so glad you cam e to my site because I was able to see yours. Your work is absolutely beautiful and inspires me to do more watercolors and canvas work.I’m in the declutter, worse before better phase so I could really relate to this piece! 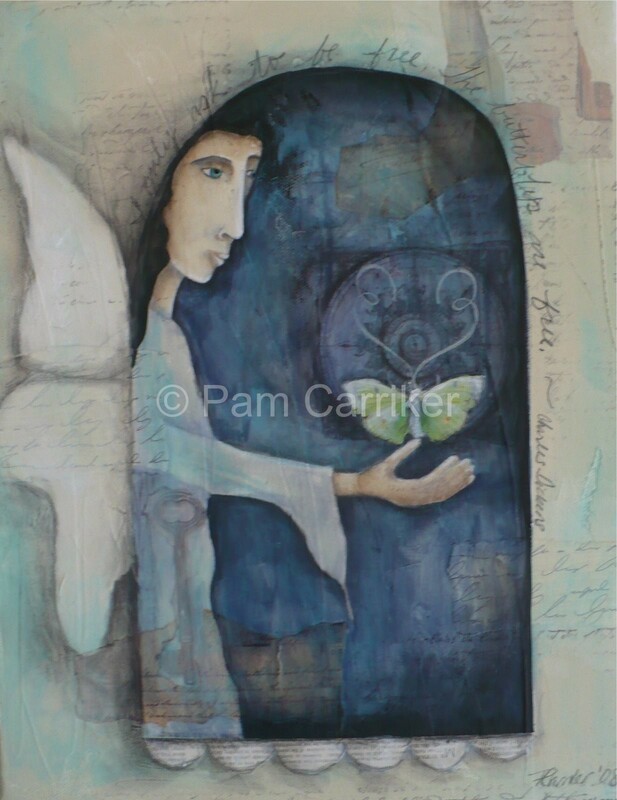 I understand that feeling completely Pam — clutter and chaos make me feel “chained” — having a really good purge makes me feel lighter…and I love this piece of art — a perfect title for it! !